If the liturgy is a dialogue between God and his people, in the Proclamation section God does most of the talking. God speaks to us primarily through his word–the Bible. The sermon is an encounter with, not just the Bible, but God as revealed in its pages. What we find in the Bible is a collection of ancient texts that were written for us, but not to us. The Bible is a story. That’s not all it is, but it helps us to understand how to approach it. It is not our story, but it is the story in which we live, not just Christians, but all of humanity. It is a story centered on Jesus Christ–the Word as spoken of by John in the first verses of his gospel. Rituals are not empty, they are full in the sense that they train us on the deepest level. What sort of training is provided by the weekly repetition of the prayer of illumination? It trains us how to approach the Bible. This prayer is an admission that we need God’s help, to understand what we find in scripture, an admission that we can’t rely on our own reason and knowledge to understand. This is an acknowledgment that the Bible is a book that must be read with spiritual assistance–the Holy Spirit. This prayer focuses our attention beyond ourselves as readers, indeed, beyond the text to our Lord, Jesus Christ, the Word of God. In this prayer, we anticipate the working of his Grace through our encounter with the text. In a real sense, then, we are preparing for a supernatural event. The Sunday Prayer of Illumination will change how we approach daily devotions on Monday, for it is a reminder that the words of the Bible are a site of miraculous encounters. The sermon is, or ought to be, about the Bible. What the Bible isn’t is an encyclopedia, or an instruction manual for life, or a rule book. It’s hard to resist looking at the Bible in these ways because our cultural default is set to view everything as an object that might have a use. In a recent Tweet, Tim Keller said, “It is impossible to understand a culture without discerning its idols.” This applies to our culture as well. And one of our idols is Reason. Rationalism is the idea that the best, or even only, way to know things is through human reason. Our confidence in human reason has taken some blows in the last century, but we still stubbornly hold onto our faith in it. It is so powerful that it has effected how we read and understand the Bible. As Christians, we believe that the Bible is true. As Westerners, we believe that truth is an object of human Reason. The Bible, then, becomes nothing more than an object that we study and use as rational subjects. We look for “applications,” instead of implications. We get too wound up about biblical inerrancy. But truth is much bigger than fact or useful information. The Bible becomes something more like an encyclopedia than a story, or a poem, or a painting. As Western Christians we must resist this limited notion of Truth. Rather than give a long rational treatise on what the Bible is, let me do what the Bible does and offer a picture of what a sermon, rooted in the Word, can be. We are dry and lifeless. The Word of God, preached by inspired human authors, brings life. God could himself speak directly to the bones, but he chooses an intermediary–Ezekiel. He uses the preacher before us. This image presents the Word, not as an object that we approach as rational subjects, but as active agent. We are the passive pile of dry bones–we are the object; the Holy Spirit is the subject. He brings life though the hearing of the Word. God is active in the sermon. 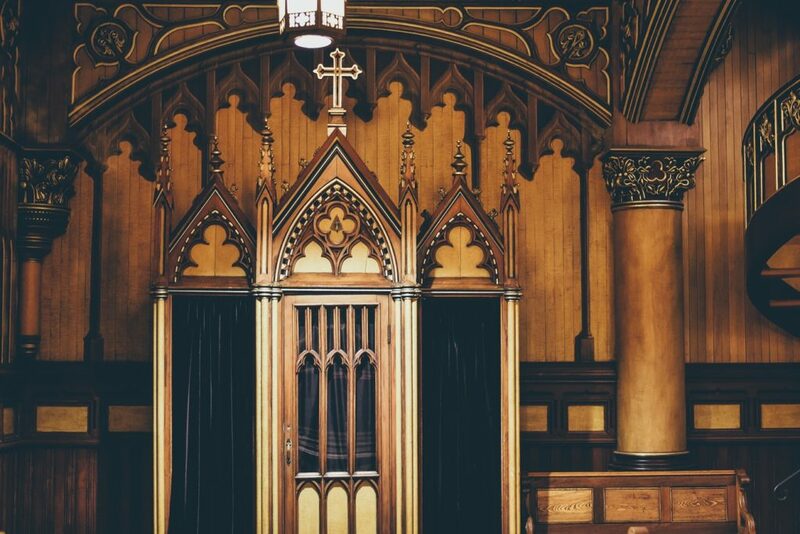 In some churches, there is only an occasional song of confession, but somebody usually includes a confessional element in a prayer at some point, but confession isn’t a very big part of what I call modern, non-liturgical church services. Confession is important. It is about sin, and sin is a big thing in Christianity. We all sin more or less continuously, so we need to repent again and again. And when we do so honestly and regularly, we get a much better picture of who we are. And how much we need forgiveness. In the traditional liturgies of most denominations, we practiced confession weekly, and in this repetition, garnered long term beneficial effects. These benefits are derived from turning our love toward God, through ritual. Rituals have the power to shape our identities, and if we are not deliberate, cultural liturgies will shape them instead. The liturgical worship service is structured around a dialogue between God and his people. God calls us and Greets us, we respond with praise. Then God speaks through his word; we are reminded of God’s expectations for us in the reading of the Law. This is often the Ten Commandments, but there are many suitable passages, like Micah 6:8. The point here is that we need to be reminded that God has expectations, and we have failed to live up to them. We are disobedient and rebellious. Thus, we need to repent. We are called to confession. We have to be called because we don’t really want to do it. True confession is hard because we have to look at who we really are. An honest look at oneself does not happen easily. We might need some practice–maybe even a thousand cracks at it. But if you deliberately practice confession in church every week, it will begin to be a daily rhythm, and you’ll be good at it in less than 20 years. The call to confession reminds us that what’s wrong with the world is not out there somewhere but within me. I need a reminder, especially if I look at social media occasionally. The sins of others are so obvious on Twitter. The call to confession repeated weekly can begin to remind me that I am the problem with the world. Until we realize that our biggest problem in life is not out there, but in us, we haven’t really come to a Christian understanding of reality. The repetition of ritual helps us to accept this reality in ways far deeper than intellectual consent. This is the power of ritual. If confession is just a mention in a prayer by the worship leader, then I might quickly confess the first sin that comes to mind. I can usually remember one. But, this is inadequate. I have committed a lot more sins than this one. Then there are the sins of omission. Then there are the sins that I would have committed in different circumstances. All of these damn me. Our appreciation of God’s Grace in Redemption is proportional to the degree we understand our need for it. The only way for us to understand our need for God’s salvation is to meditate on our sin, and then confess it. Most merciful God, Father of our Lord Jesus Christ, we confess that we have sinned in thought, word and deed. We have not loved you with our whole heart. We have not loved our neighbours as ourselves. In your mercy forgive what we have been, help us to amend what we are, and direct what we shall be; that we may do justly, love mercy, and walk humbly with you, our God. We overemphasize experience in our culture–in church, we have a danger of emphasizing religious experience. Occasional experiences don’t shape us as regular ones do. The function of the liturgy is not to be new and special, but to shape us into a particular people. To conform us to reality, if you will. It’s almost a given that we must avoid “empty ritual.” But what we must realize is that there is no such thing. Rituals are full. We give a child a quarter to drop into the collection plate every week. We insist a child say the words, “I’m sorry,” even when they clearly don’t mean it. These are important things to do, for they shape the identity of the child. The shaping isn’t intellectual–in the head–nor is it a changing of the heart. In Desiring the Kingdom, James K. A. Smith says that routines and rituals affect us in our gut or bones. We are shaped into a certain kind of people by a liturgy of confession. Then, in the dialogue of worship, God speaks again. As difficult as confession is, before we even start the confession, we know what’s coming. Amazing Grace. The assurance of pardon. Human sinfulness is a big deal in Christianity, but God’s pardon and adoption into his family is the other half of the story. Both should, then, be a significant part of our weekly gathering. God’s pardon is really good news. In the Old Testament, regular blood sacrifice established a pattern of purification. Sacrifice was God’s way of removing human uncleanness so that people could be restored to fellowship with God. The sacrifices reinforce the idea that death is the penalty for sin. But it’s clearly an act of Grace that God even allows for a substitute. Old Testament animals functioned as a substitute death. The inadequacy of these sacrifices is evidenced by the need for repeated sacrifice. The death of God himself on our behalf is a once and for all sacrifice for our sake. We do nothing to earn it. It is a free gift. We do nothing but open our hands and receive it. At this point in the liturgy, God gives pardon. And we receive. Repeated every week we become persons and a people of Grace. 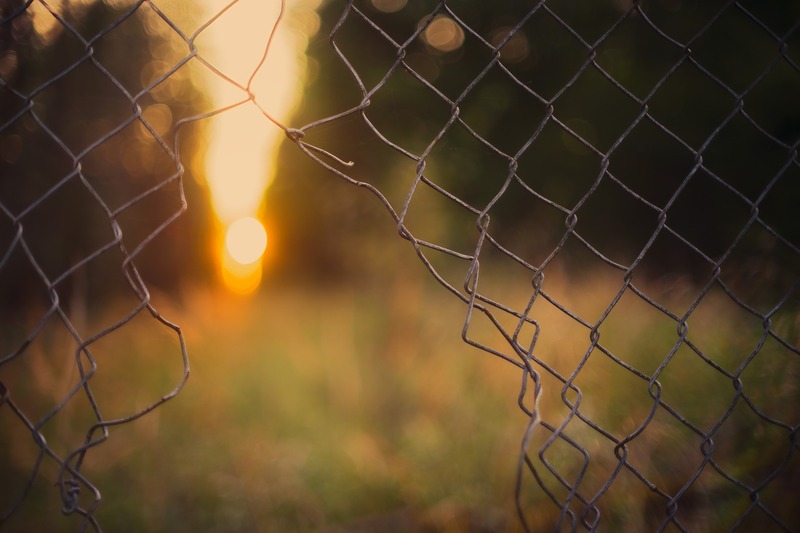 In the prayer of confession, we come to realize and admit that we are in a hard place. We cannot save ourselves. We are unworthy to be anywhere near a holy God. When we get honest about our sin, we come to an understanding of how much I need Jesus, and then we experience his Grace. We confess, God pardons, and then we express gratitude. This is to be the pattern of the Christian life. Like inhaling and exhaling. But in order for this to become the pattern, it needs to be reinforced. If we don’t practice it weekly, we won’t ever get the hang of it. We will spend a lifetime not knowing ourselves, and worse yet, not knowing the extent of God’s Grace. Occasional confession is a liturgy of omission. A church that occasionally confesses is not much better than one that never confesses. The repetition is where the shaping occurs. The church that has a significant confession element every week will more effectively disciple the people into experiencing a pattern of confession and forgiveness that will alter their lives. The Sunday confession models the prayers we can offer on Monday and beyond. If your church does not practice regular Confession and Assurance, is it time to consider including it in our weekly worship services? If it does, allow the power of ritual to turn out love towards God. 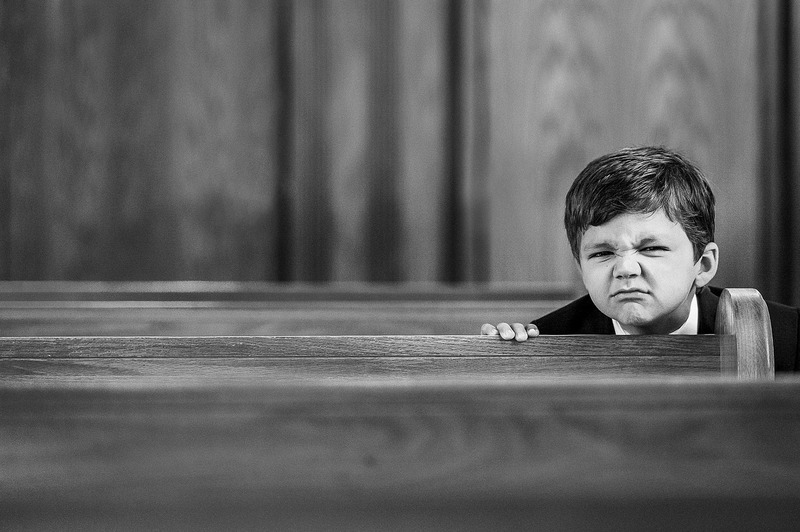 When I was a kid, Sunday church services were interminable. I thought that it might be a lot easier to endure if I had some idea as to where we were in the service. So I asked my dad, the pastor, if he could write out the service elements, in order, onto a piece of paper so that I could track along. I reasoned that the long bits, like the congregational prayer and sermon, might be easier to suffer if I knew where we were in relation to the end. Being the child of the pastor, I thought I had privileged access to this information. He chuckled and showed me last week’s bulletin. There it was–The Order of Worship–a list of all the elements in the worship service. It had been there all along, for just anyone to follow. So every Sunday, I followed along and found that the church became less arduous when I knew where we were. I discovered something else–every service followed the same pattern. The order of worship wasn’t this week’s order. It was every week’s order. Eventually, I didn’t need to look at the bulletin. I always knew where we were and the pattern became a comfort. For a long, long time, all Christian church services were liturgical. They followed a regular and predictable pattern. Even after the huge disruption of the Reformation, services were still governed by a liturgy regardless of denomination. I am only speaking from my own experience, but I began noticing some congregations were abandoning formal liturgies in the late 80s. I started seeing church signs announcing “Liturgical Services” at a different time from the “Regular Service.” Now we have lots of these modern, non-liturgical churches. These have a very simple order of worship. If they did publish one, it would look something like this. I’m being a little facetious because there are a few prayers and an offering, but these events have been shortened and are now rather streamline. It should be noted that the songs will sometimes connect to elements of the old liturgy they’ve supplanted–songs of praise certainly, sometimes confession or Thanksgiving or even a re-worked apostles’ creed–but when we rely on songs to carry these liturgical elements, they are no longer weekly occurrences and this is significant. I suppose we’ve simplified things so as to avoid confusing visitors to our Sunday service. After all, many of our neighbors are no longer familiar with church. This may be reason enough to keep the Order of Worship simple. But perhaps we’ve lost something. What does God do during the church service? In the modern, non-liturgical churches it is easy to get the idea that God doesn’t do very much. At least little is implied about his actions. During the songs, he might be sitting there listening and smiling. And what does God do during the sermon? He is of course speaking, but do we frame the sermon in such a way as to leave the congregants no doubt that it is not just the preacher who is speaking? Are the faithful are allowed to think God is listening indifferently–after all, he knows it all already. How many people would say that His attention is drawn to another church somewhere else in the world that happens to be singing at the time because God likes the singing part the best? God merely receives human worship. Passivity is not a characteristic of God as presented in the Bible. The passivity we attribute to him is a product of secularization. In the West, we have created artificial categories between physical things and spiritual things and then we marginalize the spiritual things. The Western church is not immune to secularism. Lot’s of people still believe that God is there, but they aren’t really sure what he does. It seems like he’s a long way off, no doubt hearing our prayers, but is he really acting on them? Christians influenced by Modernism experience a narrowing and weakening the presence and power of transcendent things in the immanent frame. By stepping away from traditional liturgies, we’ve not eliminated liturgies, we’ve just adopted new ones. If we haven’t been deliberate, we’ve simply replaced tratitional liturgies with secular ones. Thus promoting and perpetuating secular ideas through corporate worship. Habits, rituals, and liturgies are important. They shape how we think and they shape who we are. We can ritualize God’s passivity and the weekly repetition will eventually shape how we think, and even who we are. God’s passivity won’t just stay in church, we will eventually come to think of God as passive in our lives and in the world as well. The converse is also true. If we shape our worship service around God’s active interaction with his people, this idea will leak into Monday and beyond. Who greets us? This greeting is all about the actions of the worshipers. We have decided to come to church this morning. Apparently with some inconvenience, for we have earned gratitude from somewhere. Who owes us this gratitude? The worship leader? God? Does God owe us something because we chose to come to church instead of watching the first half of the football game? The Call to Worship suggests that someone is calling. It is God himself who draws us to church. He gets the first word. We are not there because we chose to be there; we are not there because our parents made us come; we are not there because we are trying to impress that cute girl with our religious zeal; we are not there because this is what we always do on Sundays. We are there because God has drawn us there. Our bodies are there, but where are our hearts and minds? The call to worship marks a turning toward worship, toward the throne of heaven, toward God. The preceding week was full of joys and challenges involving relationships, obligations, worries, and diversions. In the call to worship we are turned from ourselves, toward God. And The Greeting is his. What kind of people do we become if we are regularly thanked for deciding to come to church? What kind of people do we become if we repeat, week after week, God’s active calling to corporate worship? Next comes an act of praise. Our action follows God’s action. Importantly, this act of praise is not the result of the worship leader asking us to stand and sing nor is it caused by the first cords of music. Praise is the result of our attention being directed toward God. This may not be automatic for everyone. But it’s what the liturgy teaches through repetition. With ritual repetition, this will eventually come to be our natural response. To make the Sunday worship service just a bunch of human activity, well, that’s Who Framed Roger Rabbit without Roger Rabbit. Our Sunday worship needs to show God’s activity because he is active. If we can’t see what he does in Church, how can we see him as active in our lives, let alone the world? God doesn’t just sit up in heaven waiting for Sunday when some people will sing songs at him. A weekly reminder that God calls us to worship will begin to change how we view ourselves, the world and the God who sustains it all.